Things were good. As good as they’d been in years. Maybe ever. IPhone in hand, Aaron lay in bed and focused the baby monitor app’s display in on Simon’s little chest rising and falling. Then out, in order to see Simon’s hands and feet. They were fiery white blobs against the flat-white crib mattress sheet. The infrared light shone from his son’s skin in the next room over. It shone from his baby’s face, fingers, and toes. Aaron focused the display in, and the light shone from Simon’s nose and cheeks. “You were laughing,” Amelia said. He tried to direct his thoughts away from Simon, though not toward the next day’s numbers at work. The featured Hot Momma wore pink bikini bottoms and a humongous floppy hat that hid her face. She cradled her pregnant belly with one arm and covered her bare breasts with her other, the hand of which held a giant untouched cupcake. “These Hot Mommas Are Eating for Two!” read the caption below. Except the Hot Momma hadn’t been eating at all. Aaron could see her collarbone and shoulders jutting out of her taut skin. She was suffering, the Hot Momma, and it needed to stop. Someone had to save her. The Hot Momma looked malnourished, starving, obscenely pregnant, and forced to pose with a monstrous strawberry cupcake. Aaron shook off the thought. He was trying to shake off thoughts like these lately. Thoughts that brought attention to imaginary injustices. Maybe the Hot Momma was blessed with a high metabolism. Which was part of what made her so hot. She was a movie star, Aaron remembered. Maybe she’d devour that cupcake and ten dozen more. Aaron tried to relax. He was lucky to live on this block—the nicest block in Bed-Stuy—and lucky to be sharing a life with Amelia and Simon, who breathed steadily on the video feed in Aaron’s hand. He was lucky to have a baby who looked just like him. Everybody said it. Well, we know whose baby this is! Both Aaron and Simon had hardly any neck and tiny ears. Aaron had never been proud of his tiny ears before. They both had little bug noses, too. Amelia said their noses were cute on both of them. Aaron thought it might be slightly narcissistic to enjoy looking at his boy as much as he did. Before he went to sleep, he pretended to be working on his phone sometimes. But he was gazing at Simon—even though at night the infrared light meant all he could see were gray patches and blindingly white ones. He watched the bright packet that was his son’s chest rise and fall. He thought about how funny it was that this little baby was going to grow up with him as a father, with Amelia as a mother. With these neighbors as neighbors. That this life would be this baby’s life. That this baby’s father was an investment manager and this baby’s mother profiled celebrities for glossy magazines. Aaron reminded himself to breathe. To slow down his breath. Nobody felt relaxed on Sunday evenings. 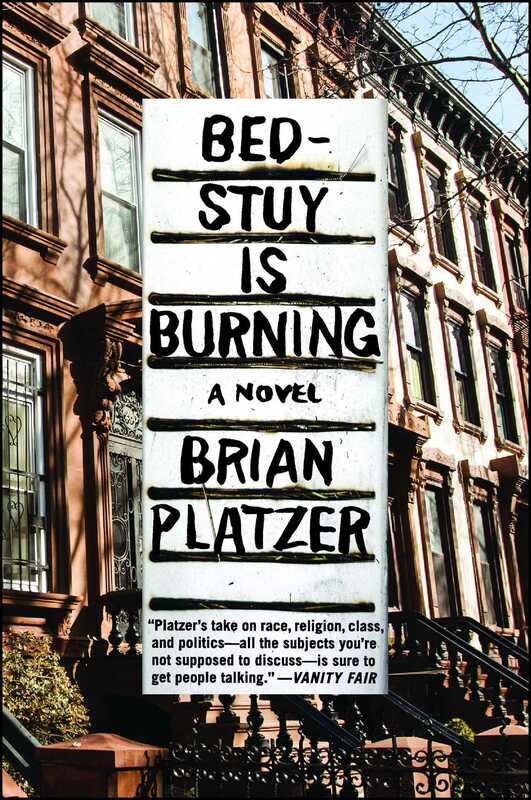 This reading group guide for Bed-Stuy Is Burning includes an introduction, discussion questions, and ideas for enhancing your book club. The suggested questions are intended to help your reading group find new and interesting angles and topics for your discussion. We hope that these ideas will enrich your conversation and increase your enjoyment of the book. Aaron, a disgraced rabbi-turned-Wall Street banker, and Amelia, his journalist girlfriend, live with their newborn in Bedford-Stuyvesant, one of the most dynamic and historically volatile neighborhoods in New York City. The infusion of upwardly mobile professionals into Bed-Stuy’s historic brownstones belies the tension simmering on the streets below. But after a cop shoots a boy in a nearby park, conflict escalates to rioting—with Aaron and his family at its center. Pulled into the riot’s vortex are Antoinette, devout nanny to Aaron and Amelia’s son; Jupiter, the single father who lives on their block with his son, Derek; Daniel, Aaron’s unhinged tenant in their basement unit; and Sara, a smart local girl roiling with confusion and rage. As the day unfolds, these characters are forced to reckon with who they are and what truly matters to them. 1. The novel’s epigraph is a quote from the Bible, depicting the story of the Tower of Babel. Discuss the significance of this quote and its relevance to the novel. What themes from this story appear in Bed-Stuy Is Burning? 2. One of the effects of telling this story from multiple perspectives is that we observe some of the differences and similarities between how these characters see themselves compared to how others see them. Consider one of the central characters, such as Antoinette, Daniel, or Amelia, and discuss how they are portrayed through the viewpoints of others during the course of the novel. 3. When you first read Amelia’s essay, “The Paradox of Bed-Stuy” (pg. 45-49), what was your reaction? If you were commenting on the post, or responding to one of the existing comments, what would you write? 4. When describing why he became a rabbi, Aaron thinks, “ . . . that was what he felt down to the core of his being: that he should live his life in a way to redress the horrors that had come before him” (pg 10-11). Do you agree that rectifying past atrocities should be a primary guiding force in people’s lives? In the case of Aaron, was this a good reason to become a rabbi? Do you think you’re doing anything in your life with the same motivation? 5. What is the significance of Part One of the novel taking place during Rosh Hashanah, the Jewish New Year? 6. Which characters did you most identify with in the novel? Were there characters you couldn’t connect with at all? If so, which ones, and why? 7. Given Daniel’s initial sympathy with his black neighbors, were you surprised by how he responded to Sara and her friends? What were some of the factors that led him to react in that manner? If you were in his position, what do you think you would have done? 8. What do you think appeals to Bratton about taking a “medical approach to dealing with crime” (pg. 243)? What are some potential drawbacks to this clinical mindset? 9. Discuss the role of faith in the novel. How do Antoinette and Aaron’s beliefs and use of ritual for healing and protection complicate or adhere to your notion of religion? Beyond religion, what other forms of faith do you see in the novel? 10. What was your reaction to Amelia capitalizing on what occurred during the riots to further her career? Do you think you would feel differently about her actions if she had used the story with no benefit to Sara? Why or why not? 11. Guilt is a theme that echoes throughout the book, with characters questioning who is at fault, either feeling or shirking guilt, as well as placing blame on others. Look at a few examples from the book, such as Aaron’s attitude toward his gambling, Amelia’s role in Mr. Jupiter’s death, Daniel’s resentment of Aaron, or any character’s understanding of who is to blame for the tensions in the neighborhood. How do these characters’ senses of responsibility change over the course of the book, if at all? In what ways can guilt be a useful or destructive emotion? 1. While Jason Blau’s death was fictional, the issue of police violence is very real, as are the cries for resistance and reform. Consider reviewing some goals of current organizations on this topic, such as Black Lives Matter’s Campaign Zero (www.joincampaignzero.org). As a group, discuss these potential policies. Do they seem like effective ideas to you? If they were implemented, how do you think they would impact some of the scenarios shown in the book? 2. Take a look at the history of where you live, or the community you grew up in. How has the area shifted, racially and/or socioeconomically, over time? What were some of the causes or consequences of those changes? If you’ve personally encountered gentrification, either as someone moving into an “up-and-coming” neighborhood or someone who has been displaced or disadvantaged by rising costs, consider sharing your experiences with the group. 3. Write a short story involving Simon or Sara, fifteen years after the day of the riots. If you’re writing about Simon, consider how he relates to his neighborhood. Was he impacted by what he witnessed as a baby? What have his parents told him about that day? What will he believe about racial tensions, police violence, and/or gentrification? If you’re writing about Sara, what was her experience in private school or college like? Did she become a lawyer, as she planned? What is her relationship with her brother like now? How does she feel about everything that happened, looking back? Share your stories together as a group. "Platzer writes insightfully about political issues while providing a panoramic take on New York that embraces the city's enormous complexity. This deeply moral book avoids easy conclusions and courts that ambiguity that is the hallmark of all great fiction."